Milking cows and making cow dung cakes Content on Punjabi television gets a rural makeover with ETC Channel Punjabi's new show, "Sadde Pind Rabb Vasda". As the importance of a village, its history, cultural reference or economical importance will be seen and to add value we will see villagers with varied talents... from singing, playing a musical instrument-tumbi or dhad sarangi or algozha, the meticulous display of gatka, a renowned craftsman or any other specialty of the village that is worth an acclaim. Sharing his views on the new show, Ravi Arora, Business Head, ETC Channel Punjabi said, "This show is an extension of the wave of rural themes popular on fiction content these days. We thought why not bring it to the non-fiction space and show the real aspects of a village since we have been trying to strengthen our base of non-fiction offerings,"
Phulkari di kadai or Rasse watna.. anything which is art & from farming to milking, from playing cards at saath to watering of the fields, from lying down on manja to working in the kitchen... the whole crux is to be within the villagers and go through with their daily schedule. 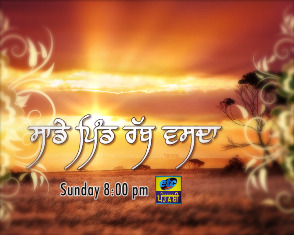 With "Sadde Pind Rabb Vasda", the channel is attempting to add a new flavor in the genre of the non-fiction space. People in Punjab are known for being the 'bade dilwale'. They are very warm and are excited about having to share their homes with the world. Come & witness the lush green paddy fields and wonderful scenic beauty of the Pind with ETC Channel Punjabi's new show, "Sadde Pind Rabb Vasda".